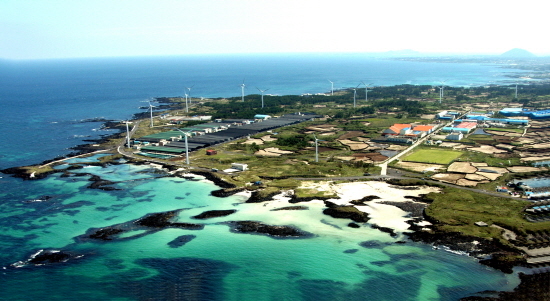 Jeju self-governing Province, a province consisting of several islands with 604,771 (2014) inhabitants, intends to meet the islands energy needs with 100% renewable energy. In 2012 the Jeju Energy Corporation (JEC) of the Jeju province set the 100% renewable energy goal by pledging to become a “carbon-free island by 2030”. By setting this target the province intends to become completely independent from the electricity imported from the Korean Peninsula and meet all its internal electricity demand by using only renewable energy sources from within the islands. This initiative includes the replacement of the current fossil-fuel fired generator with offshore and onshore wind turbines, solar panels, small hydroelectric power plants, and power storage systems. Electric cars, house energy management system (HEMS) and other technologies will also become available for the residents of the islands. The first phase intends to make Gapa Island, a small island located South of Jeju, carbon free, turning it into the testing laboratory of this ambitious initiative. The second phase intends to raise the share of renewable energy in the total energy market for the island to 50% by 2020. The third phase intends to make Jeju Island a world-class carbon-free city by 2030. The focus of the first phase will be set in the community of Gapa Island, a small island located South of Jeju. In partnership with the municipality and with central government agencies, Gapa Island has now completely switched to a carbon-free electric grid. The island’s energy needs are supplied by 100% renewable energy coming from wind turbines and solar photovoltaic systems. Electric vehicles for transport and HEMS have been placed in every household on the island. Governor Hee-ryong Won lately mentioned that Gapa island now is the first in the nation to run solely on renewable energy sources. As a result, Gapa island reduces 776 tons of CO2 emissions and saves 300,000 liters of fuel every year. To accelerate the second and third phase, Jeju province will be granted large investment funds both from the central government of Korean and from local investors for the installation of renewable energy technologies as well as for practical smart grid experiments. JEC projects that by 2020 1GW from offshore wind power, 350 megawatts from inland wind power, and 30 MW from solar power will add up to 3,585 GWh, or 68% of Jeju’s total electricity demand (currently electricity demand is 5,268 GWh per year). By 2030, offshore wind power generation will rise to 2GW and solar power generation to 100 MW. Based on overall projections, wind and solar power sources will be able to supply approximately 6,561GWh, which is more than the projected total yearly amount used on Jeju Island by 2030. Another project, the Jeju Test-Bed for the Grid, will offer a testing platform to improve the integration of renewable energy and energy storage facilities within the grid. A total of 168 companies are participating in the project, which covers approximately 6,000 households throughout Jeju Island. Jeju’s smart grid will become the world’s largest smart grid community that will allow the testing of the most advanced smart grid technologies, offering great opportunities for R&D within the field of renewable energy and energy storage as well as for the development of new business models.